An interest in of all sorts of vehicles has always played a big part in my life. It all started with plastic kits (doesn't it always?) 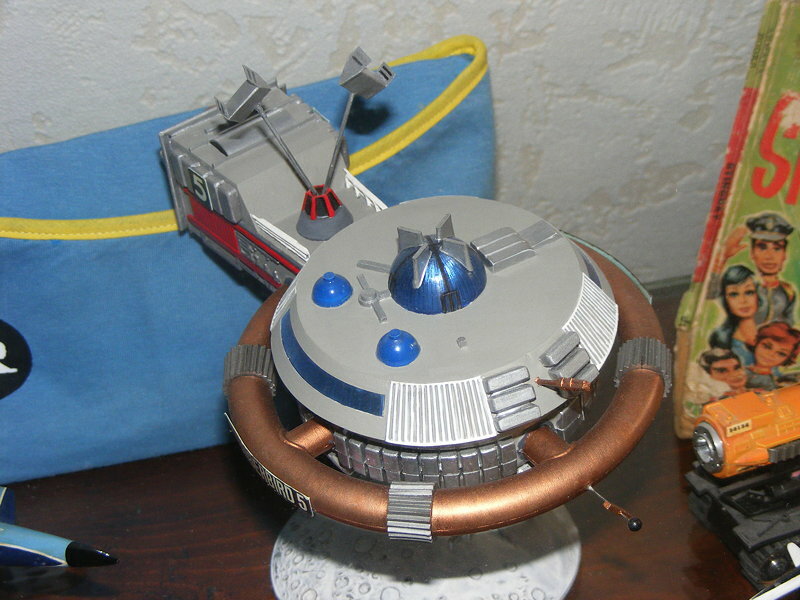 but throughout the years I increasingly felt the urge to either build fantasy models or to produce models of existing designs that are not commercially available. In this section you'll find some of my creations. Some where born as physical expression of my fascination with a certain subject, some are conceptual studies and others have even been part of a true development process for my won designs. The mentioned years indicate when the model itself was built. In the case of my own concepts the actual design process normally started much earlier. My models are scratchbuilt and do not try to be the ultimate in realism. What I normally aim for is more of a period factory display model look. Whoever thinks that my fascination with military aircraft is somewhat at odds with my view on humanity (as expressed elsewhere on this website) is totally right. We should never use weapons, thus should we never build them, thus should we never design them. As a purely mental exercise the challenge to come up with an advanced design can however still be a very interesting one. Furthermore: Who says that such a craft has to carry weapons? So please forgive me my somewhat untypical fascination with the subject. One of my favorite subjects are VTOL aircraft. 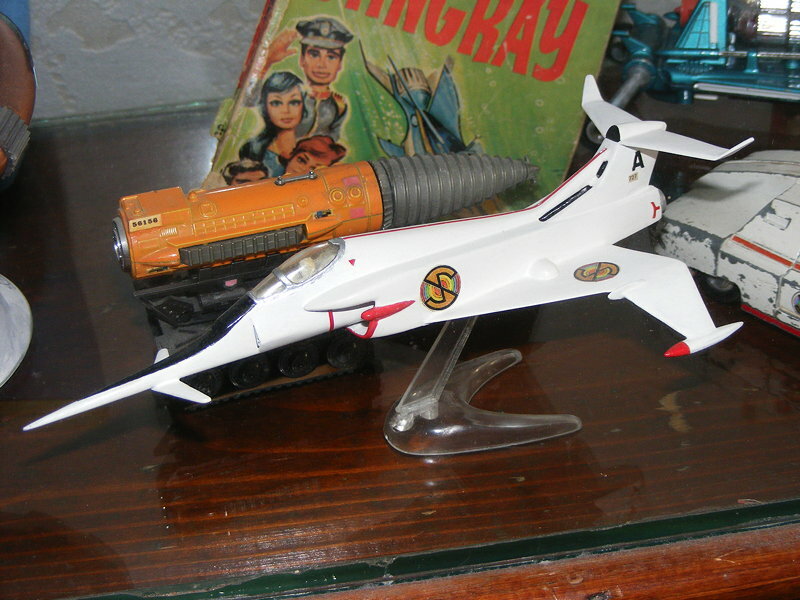 Airplanes that can reach very high speeds but at the same time are able to land on a space as big as their own shadow have always intrigued me, ever since I saw those Jerry Anderson's Thunderbirds craft effortlessly whizzing around on television as a very young boy. One of the most interesting subjects in the slowly evolving tale of V/STOL combat aircraft is the 1960's NATO NBMR-3 competition. NBMR stood for for NATO Basic Military Requirement and nr. 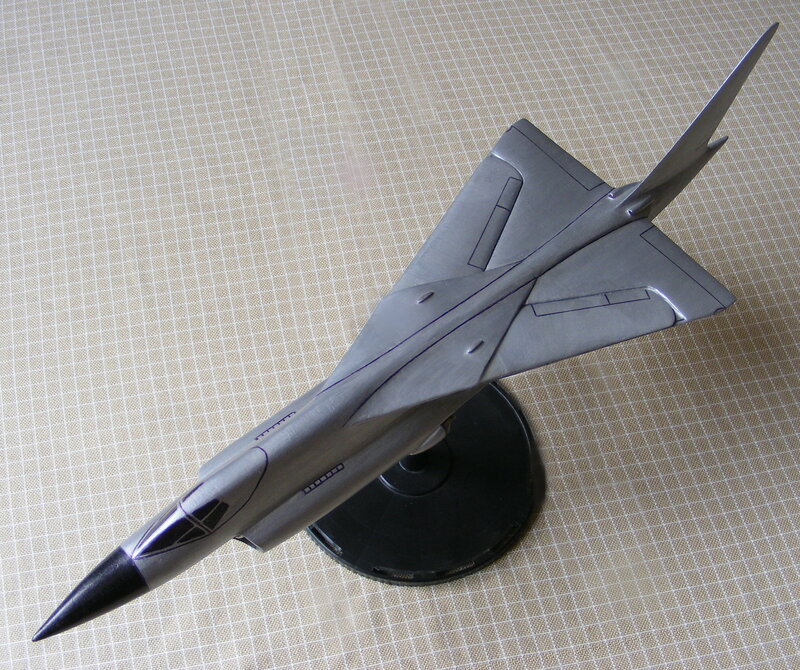 3 in the series asked for a jet combat aircraft that would be on the cutting edge of fighter design but could also be dispersed over improvised airfields in the (very probable) case of Sovjet troops taking out all existing bases. Nothing came of any of the NBMR's. National pride and/or U.S. defense industry bribes (as previously during the Lockheed Starfighter affair) always won from true cooperation. In spite of this a NMBR-3 winner was still announced. It was the the British Hawker P1154. Work on a prototype was actually already quite advanced when the project was canceled. In the end it still evolved into the subsonic Harrier, but whatever experts have said ever since to butter over the bruise, that always stayed somewhat of a compromise. 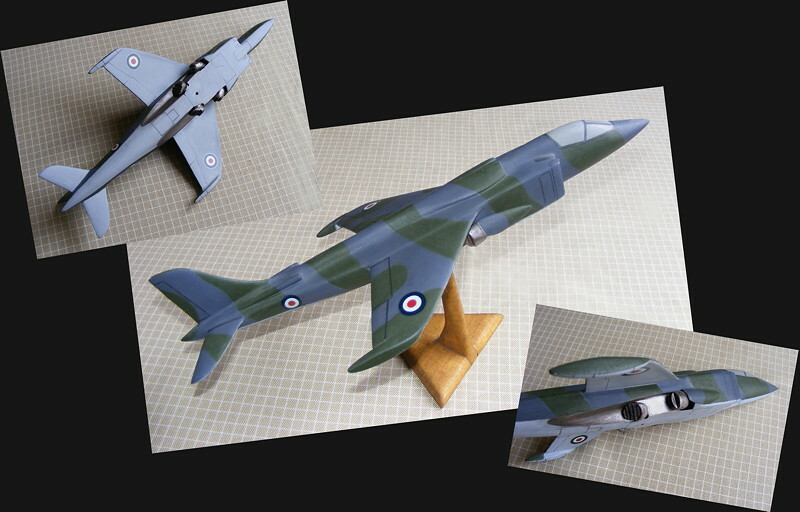 This model depicts the supersonic Harrier in it's 1963 form, before rivalry between the Royal Air Force and the Royal Navy bombed the prospect of at least a British version being built. Nowadays England has sold it's remaining subsonic Harriers for near scrap prices to the USA. This model is an indication of how things could have turned out instead. The data for my model has been extracted from various sources but is primarily based on an original Hawker drawing dated 4 November 1963. All drawings and even the original mockup of the P1154 do however stay rather vague about the details surrounding the exhausts. Projecting the measurements of the original BS-100 engine into the design however gives some interesting clues. It turns out the engine was actually inclined a few degrees from it's central axis, placing the aft exhausts comparatively lower then the front ones. The layout of the exhausts themselves and the surrounding ramps have been derived from photographs of the BS 100 engine test rig. I based the camouflage pattern on a famous photograph of a display model which has been attributed to the Hawker factory itself. Another contender for the NBMR-3 competition was this collaborative project between US manufacturer Republic and Dutch manufacturer Fokker. Although the Fokker name was used first there can be little doubt that Republic must actually have been the main party in this effort because a lot of TFX experience (which in itself later led to the General Dynamics F111) was put into this submission. On paper this was an even more impressive design then the P1154. It used the same engine (in fact Fokker Republic where the first to ask Bristol for an engine with BS-100's specs) but added a polymorphic wing, a sort of predecessor of the swing wing layout used in several later designs. 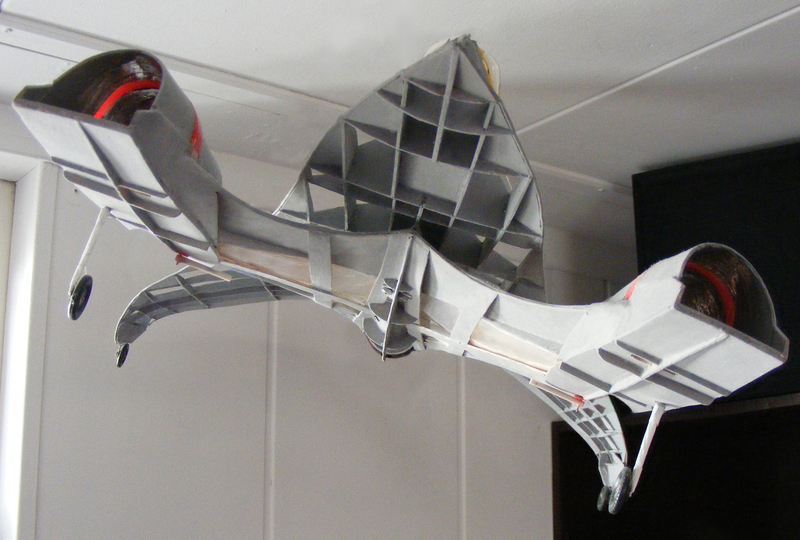 Although it would have been quite a challenge to actually build it the polymorphic wing was an intriguing option. 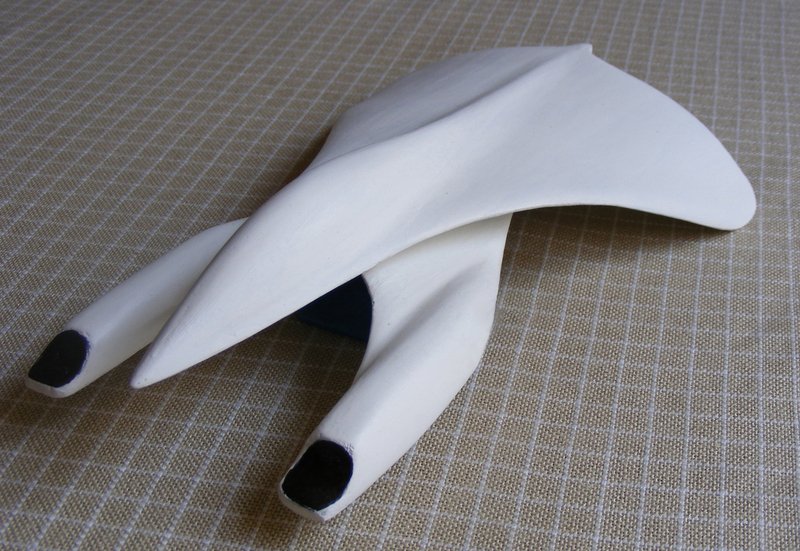 It used additional surfaces that could be fully folded away and thus not only varied the wing shape but also changed the wing surface in a profound way. As such it would have been very adaptable to solving all sorts of problems surrounding conflicting needs during fast and slow flight regimes for both centers of aerodynamics and gravity. 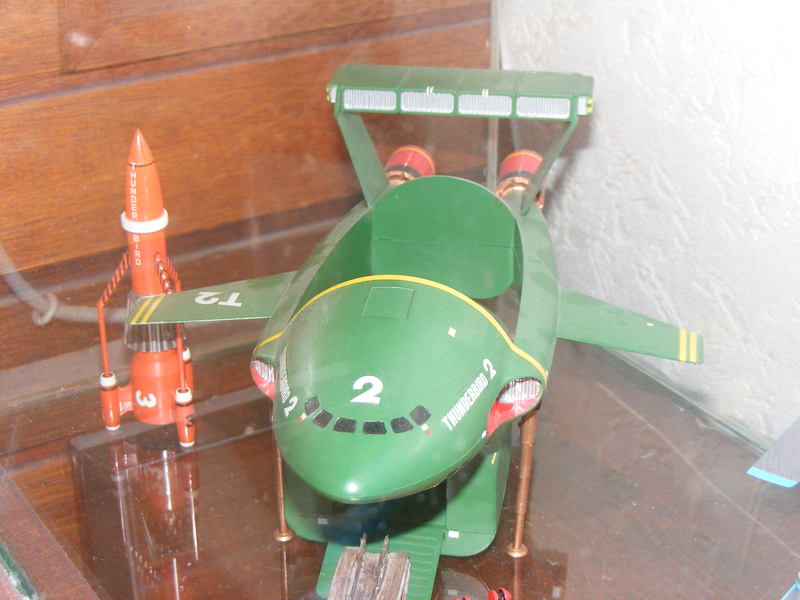 It also was one of the first designs to include short take off as an integral part of the concept. At that moment in time the competition still mainly thought in pure VTO terms. Being a total paper project it is even more more difficult to come to a homogeneous reconstruction as it is with the P1154. I based mine on some rare photographs of the original Republic model with U.S markings as displayed for years in the now defunct Schiphol Aviodrome museum. Other sources where a set of illustrations as published in several magazines and books. Some of these are rather coherent in their execution (among them those in Avia magazine September 1962 and RAF Flying Review XVII no. 12). They even hint at the possible correction of a balancing issue by adding a deepened main wing trailing edge to the delta wing. Another interesting conclusion derived from the original model is that he BS 100 engine was not tilted off the aircrafts main horizontal axis as in the P1154. 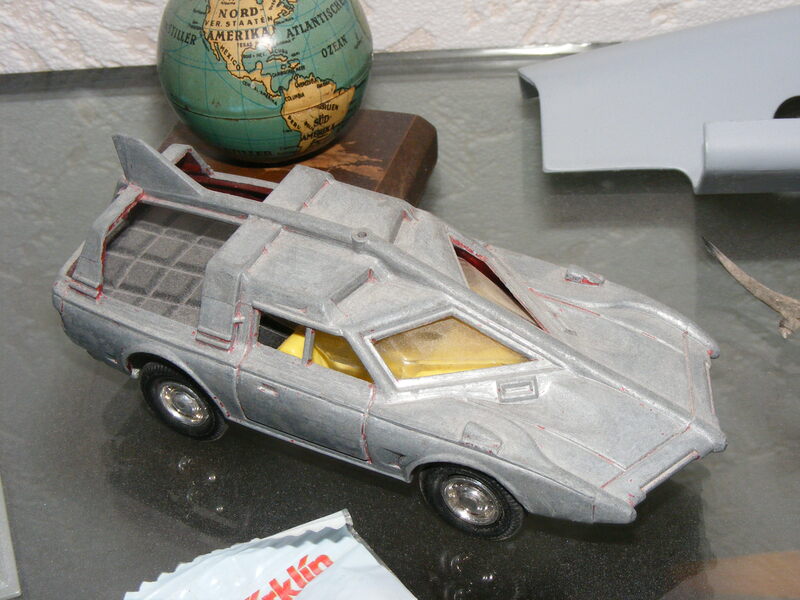 This 1:48 scale model depicts how the production might have looked. There is one probable exception though: The canopy design with it's small windows is more fifties bomber then sixties fighter style (another TFX hint?). A total transparent hood would have been much more probable for the production version though. This would however be a clear deviation from the source material. Furthermore the existing layout adds even more to the aircrafts very unique character. For that reason I decided to retain it. The question remains though: Is my model based on on a version derived from original factory designs? Or are the details from a good period interpretation by an independent illustrator? 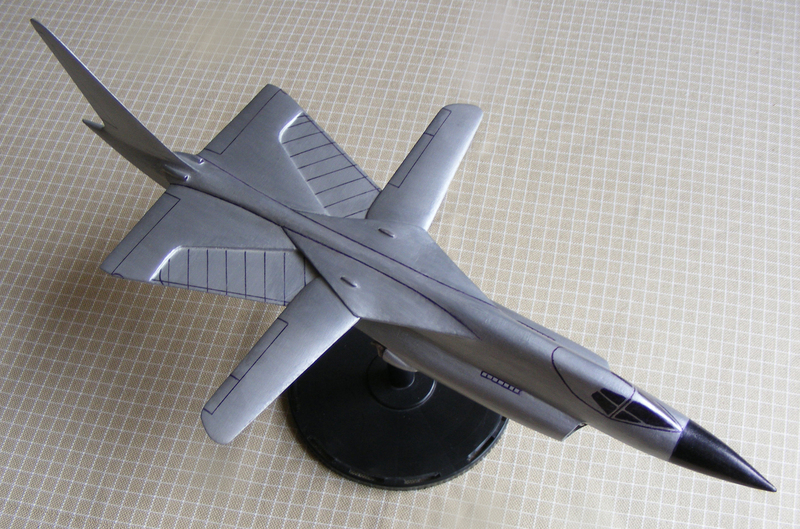 People are still working on a supersonic V/STOL (Vertical / Short Take Off and Landing) fighter designs to this day. The USSR had one as good as ready when the Sovjet Union collapsed in the shape of the Jakovlev Yak 41 and the B version of the Lockheed F35 Joint Strike Fighter is flying today. As always I think it could be done better. Yes, I am simply that kind of a guy and in this particular case I have actually been working on such a project for years. 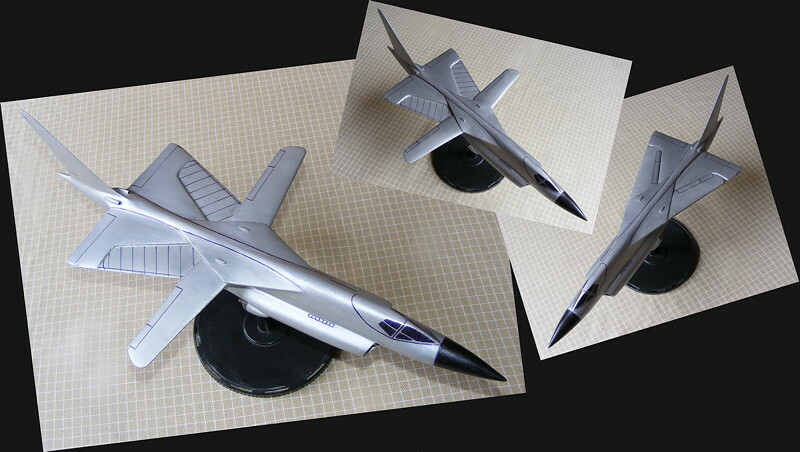 My design envisions a sort of future replacement for the JSF. It tries to provide a design that ticks all the right boxes (speed, stealth, economy, etc.) and combines this with a minimum penalty for the V/STOL capability. That's still a difficult goal to reach. The JSF almost fell over the same old problems of conflicting requirements leading to a dangerous complexity versus weight spiral. I do think my concept could solve all these problems. Hmm, better put it this way: I still have to find evidence to the contrary. One might ask how it works. Well. I'll probably take that secret into my grave. The photographic angles and some digital retouching assure that the most important details of the V/STOL system are not visible. Nonsense? Who does this amateur think he is? Could it really be that revolutionary? Well at least this hush hush approach perfectly fits into the old Cold War atmosphere from which such idea's came. Remark: A virtual 3D CAD design also exists. Maybe I'll also release some pictures of that in the future. The Pteranodon project has been one of the longest and most intense. 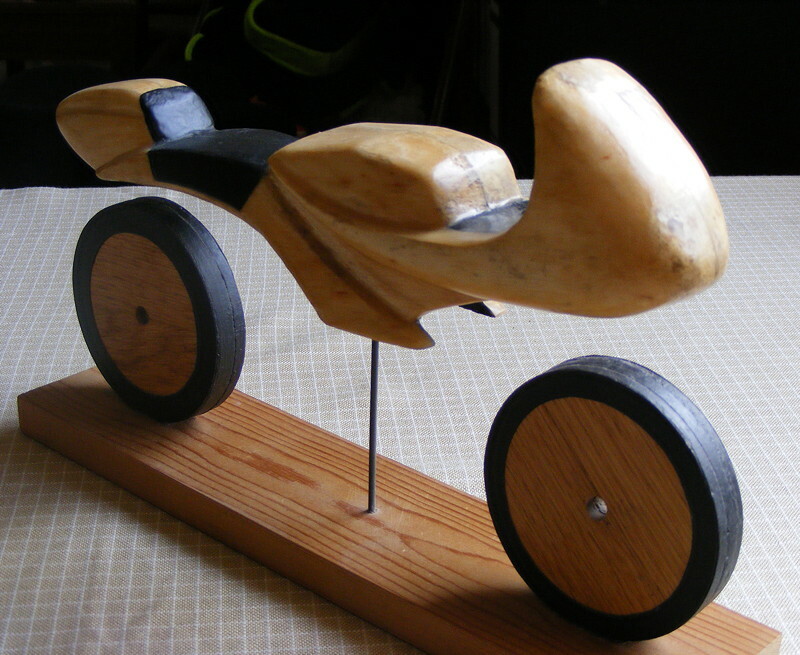 This is a 1 to 4 clay, wood and plastic model, derived from an ergonomic side elevation drawing including an average sized rider, which itself was based on the the initial sketches. It already incorporates all the functional elements for the body design. The frame is a total new design with a revolutionary front end. The rest of the running gear was based on Ducati Testa Stretta technology, as can still be seen in this model. This actually is only half a model, a very practical trick if one wants to proceed with some speed. Is building actual physical models still relevant in this day and age? It surely is. Just like felt pens and gouache can take a drawing too far from reality so can a 3D drawing in a computer "paint over" design flaws. Staying away from real models too long can be dangerous as a quite recent BMW 2 + 2 sports car project proved. I will not name the actual type here but it's design was just about to be frozen when somebody found out that the rear seat passengers would have their skulls split in half by the roof. Back to the drawing board boys! And we are talking about quality German engineering here! So never ever say that the hardware model is dead! 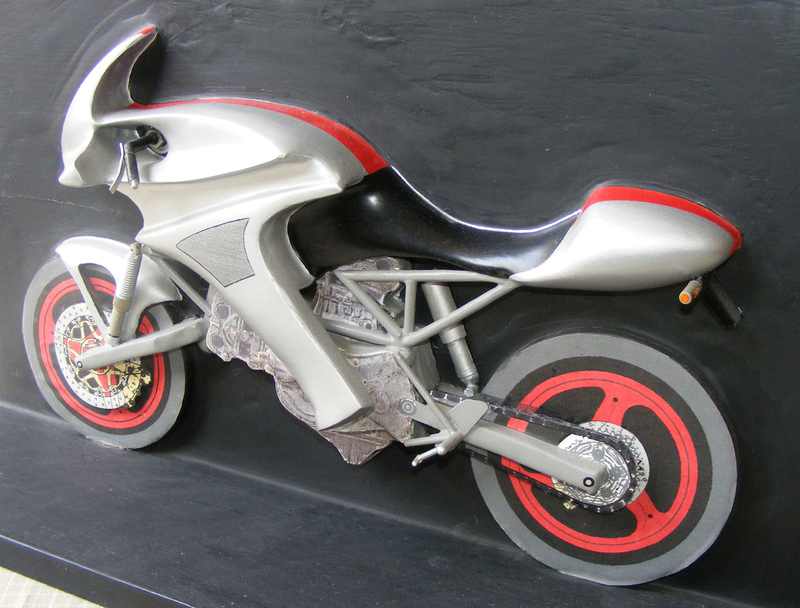 This is a conceptual model for the conversion of my Ducati Pantah 600 TL motorcycle . It resides between the sketches and drawings and the actual building of the 1 to 1 foam model. In retrospect this model adds few additional clues (except that I originally envisaged a much more spartan seat) but I still like it because it's purity and lack of actual rolling chassis details. These turn it it into a sort of subliminal representation of the sports bike idea, as if one would indeed need little more then 2 heels, a seat and a streamlined shape. Er, but what about the engine then? I know, I know! This was rather heavily influenced by the 70 ties to 80ties extreme edgy school of styling but seeing all the ever more baroque, "from clashes with function" designs of today it maybe is time for a revival of that trend. I think this design still compares rather well to the ever blander Ferrari's of today. It harks back to a time when concept cars really tried to go somewhere new. By the way: Cuneo is Italian for wedge. Geddit? I have however been told it can also be used as a rude word but maybe that only fits such a proliferating design. By the way: In real life I drive a Citroen XM, which also isn't the most rounded shape imaginable. Square or round: A beautiful shape stays a beautiful shape. This is quite an early example. 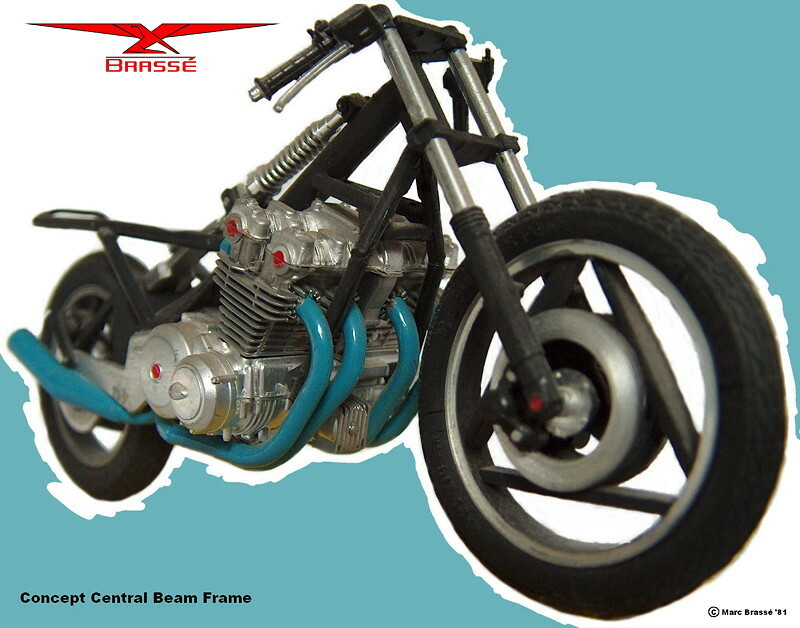 It is the model of a motorcycle frame I designed. In practice it is a sort of mix between Fritz W. Egli's famous central beam frame and a layout Moto Guzzi used on it's off road V-twins, although I actually was not aware of the latter at the time. Another interesting detail are the wheels. A few years later Massimo Tamburini designed very similar wheels for the Ducati Paso. He must have stolen that layout from me! Only joking of course but these are actually 2 examples of real world parallel development in one single design. Could it be that I have some talent for designing motorcycles myself? This is from a sixties black and white German television series I still love to death. It was a rather talky but well acted affair with special effects shots that where rather good for the time, however rudimentary they might now seem when compared to modern CGI. Some seriously obvious everyday objects where used as interior decorations though (the most famous being the inclusion of an electric ironing bolt in one of the ships consoles). Overall it however was a very stylish affair. The most important models used in the series where quite big and manufactured from, then very fashionable, transparent Plexiglas sheeting. For economic reasons I just used cardboard, paper, gouache paint and the occasional knitting needle. I actually had the most problems with choosing the colors. The series was shot in black and white but the real models where gray on top with yellow at the bottom. They used those colors for lighting reasons but believe me: in real life they look dreadful. So I compromised a bit by going for a black, gray and sliver dominated look with gold on the underside. The yellow edges are meant to impersonate the glowing aspect of the original model, which was lighted from the inside. O.K. Well, at least the proportions are almost spot on and when photographed in black and white it might actually become difficult to see the difference between this model and one of the smaller originals (with a little bit of luck, that is!). 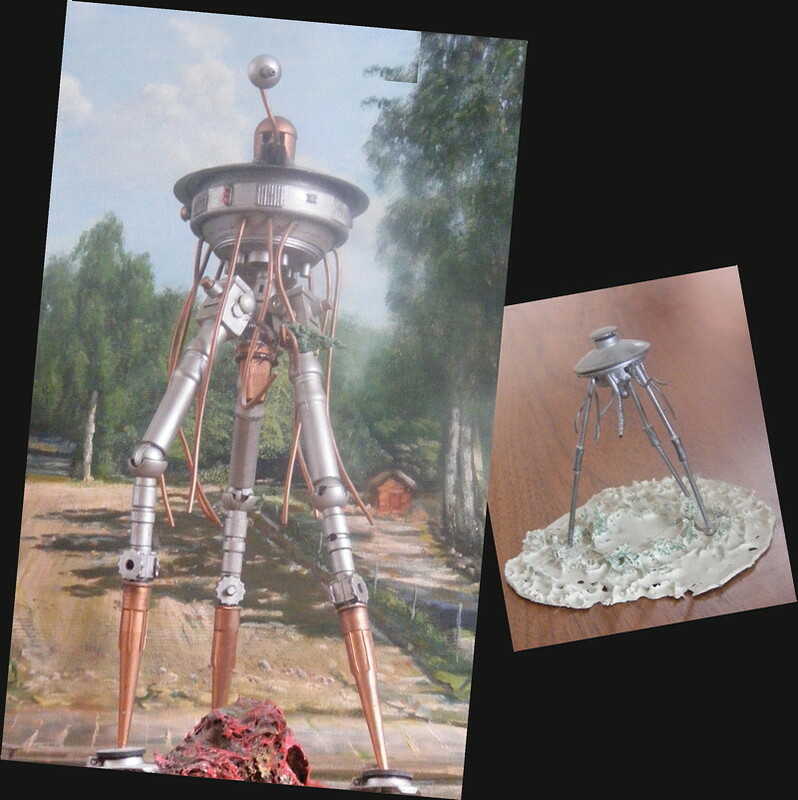 These are 43 cm and 4 cm models of Martian war machines. I've always been fascinated by the original book by H.G. Wells book and all its derivatives (also see my painting on the PAINTING page). They where completely scratchbuilt from all sorts of bits and pieces but I have based them rather literally on the descriptions in the original book. Although H.G. Wells did not give too many specific details the overall elements where rather well described. That's why so many pictures look similar. 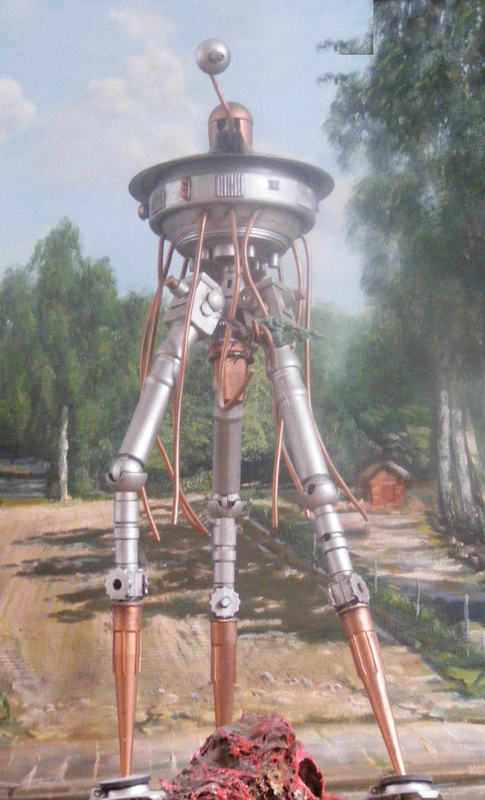 A rather blatant exception is the well known design by Mike Trim (of Jerry Anderson fame) for Jeff Wayne's musical version of War Of The Worlds. I love Mikes work and this design also looks great but it is quite far removed from H.G. Wells's description and would hardly work in real life because of inefficient mass distribution. Want to know why? Stand up, spread your legs as far as you can and then try to do some walking! Maybe one day I'll actually design and build a real working tripod. I've already got some conceptual sketches lying around. Ever since I saw the Thunderbirds as a child I have been a big fan. No, not of the Ford car, the U.S.A.F. stunt team or the band but the puppet television series. In it a bunch of millionaire sons fight every kind of disaster imaginable with their superior Thunderbirds craft. What an idea! From a time when we all still thought that technology would save us. It's creator, Gerry Anderson, made more series, like Stingray, Captain Scarlett, U.F.O, Space 1999, etc., etc.. I devoured them all. 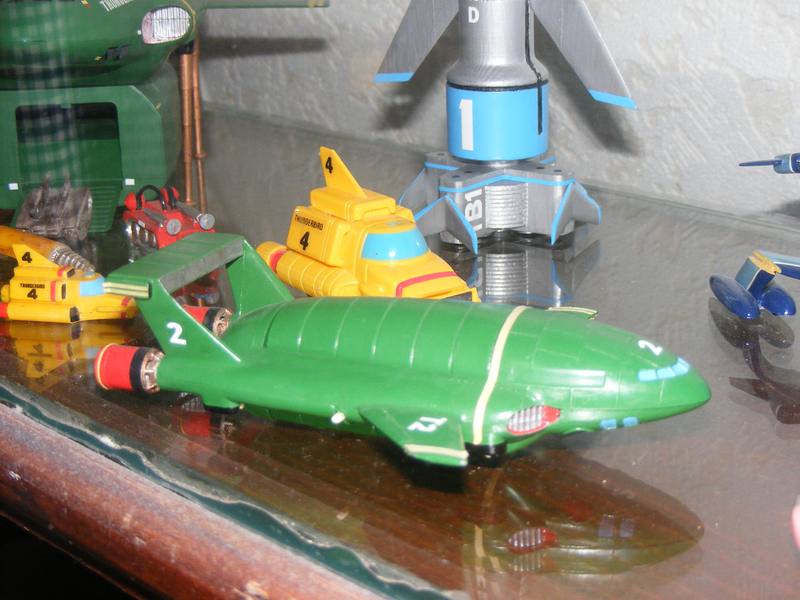 And I started a collection of toys and paraphernalia, ranging from the ridiculous to the truly collectible. I will not bore you with all the details about that here but I have included some pictures of models that I am proud of because they where totally scratchbuilt or took a little bit of extra creativity to get finished. I am quite proud of this one. 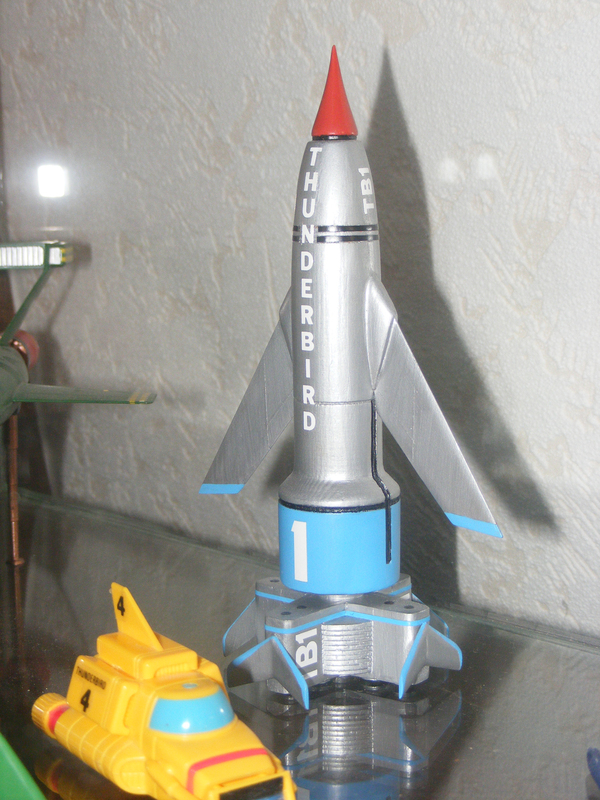 It's a completely scratchbuilt Thunderbird 1. I used photographs of the original instructions that the production company handed out as examples to toy makers to base the merchandise on. For that reason the proportions of this model are near perfect. I actually turned the main body myself on an old wood lathe which my father had built from a few old parts (Talking about being a chip out of the old block, eh?). The base of the red noscone is slightly too narrow but overall I am very pleased with the result, especially considering that the overall height is only about 175 mm / 7 inches. This looks normal enough. 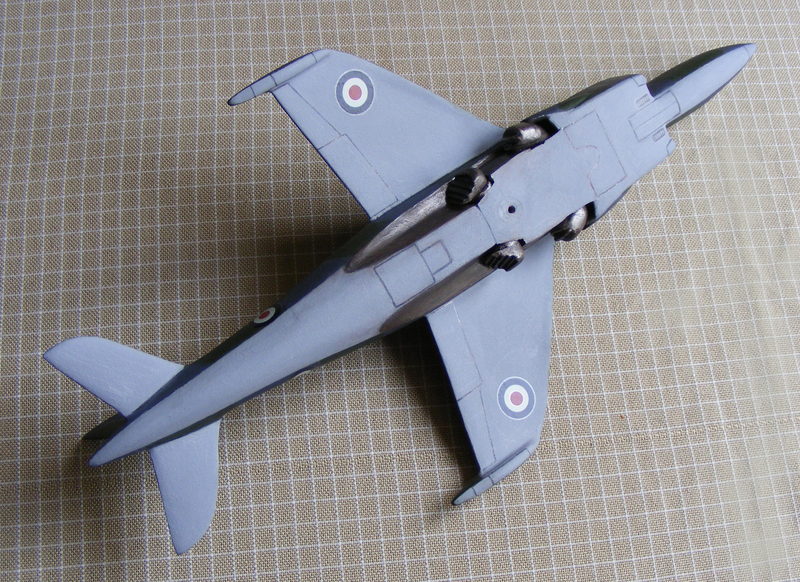 It's based on the Airfix Angel interceptor kit. It's however not the original model. The only thing I had still lying around was a battered central fuselage section. 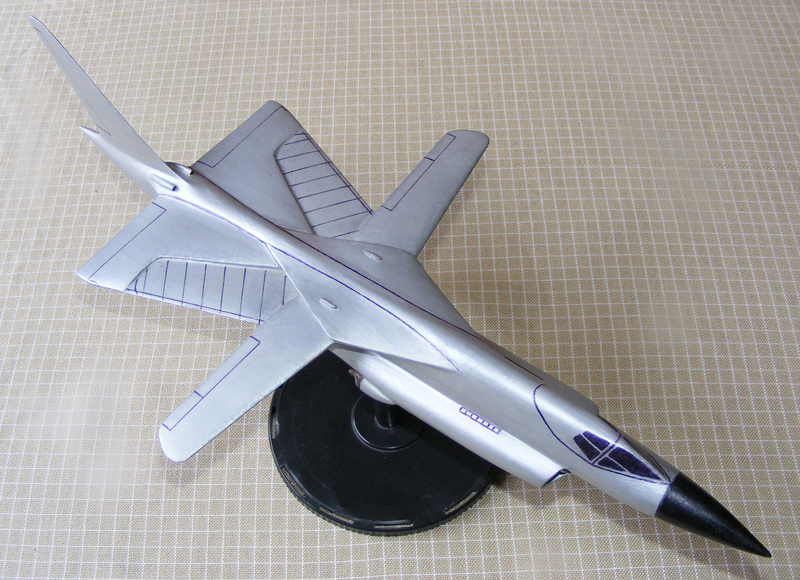 On the model you see here all the other parts (wings, tailplanes, canards, nose, etc.) are scratchbuilt. One can actually see that the nose is more pointy then that of the original kit, which was more blunt to prevent children poking their own eyes out. 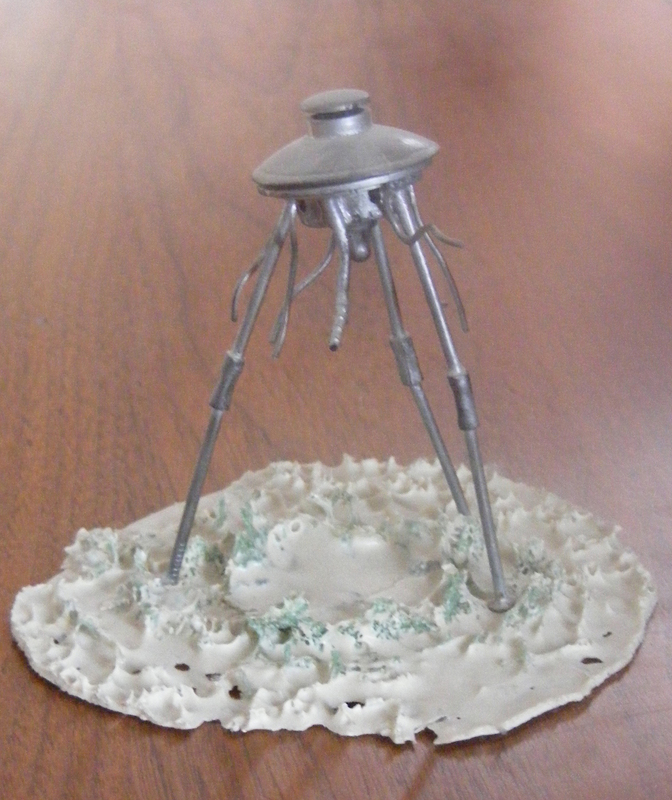 I reconstructed this model years before household color printers became available. The Spectrum Insignia where actually reproduced in black and white on a copier and then colored in with crayon. It still looks so good I have to remind myself of that fix now and then! Which is nice! 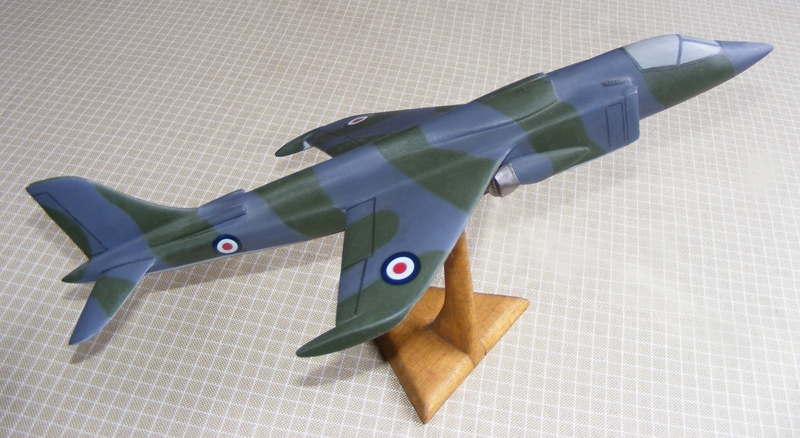 Since then Airfix has actually decided to re-release the kit itself so this model is not as rare anymore as it used to be. Still a nice result though with a rather special story attached to it. 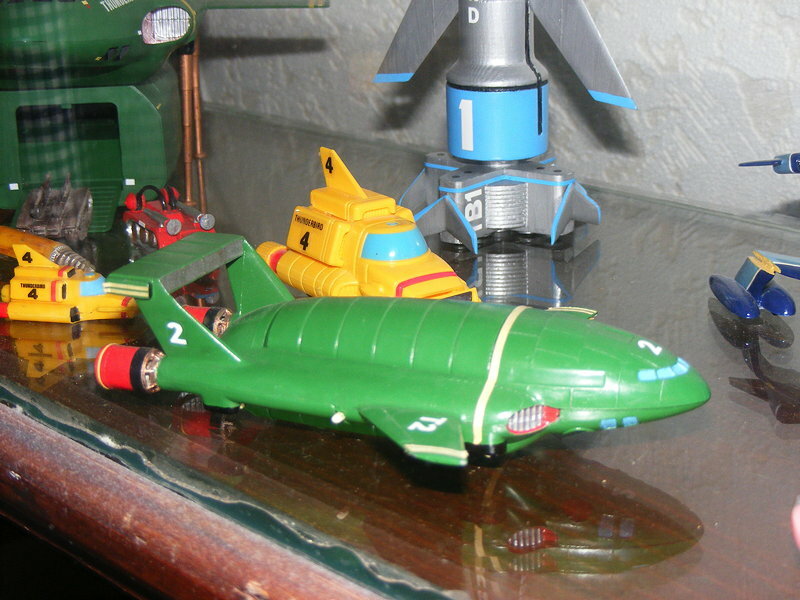 Now this is quite a rare model from the late 60ties when the series was first released. I actually had never held one of these in my hand until I bought this example on he Internet. The construction and finish are actually rather crude and the white tires are dreadful (Making lot's of money with cheap merchandised toys is nothing new) but the overall shape is quite good. In this case however the whole roof was missing. What to do then? Go for an as near to original restoration here or for the look of the real thing from the series? In this case I held back. The toy itself already exudes nostalgia, even in spite of those white tires. But what to do with that roof? After contemplating a lot of possibilities, from simply adding a silver painted blob with the right shape to having a completely new part machined from plastic (expensive!) I found a very simple solution: I just hunted down all shops in the city for something with the right and in the end was able to cut a near perfect roof out of a plastic flask. It originally contained frying oil (see picture). Since such stuff has to be replaced regularly anyway one could say that the actual cost of the part was zero and yes, the chips baked in the oil also tasted nice. The stripes where made from white paper sticker sheet and the color mixed in oil paint (Now what else would I do with oil paint?!). These Dinky TB2's must have been built in the tens of thousands. 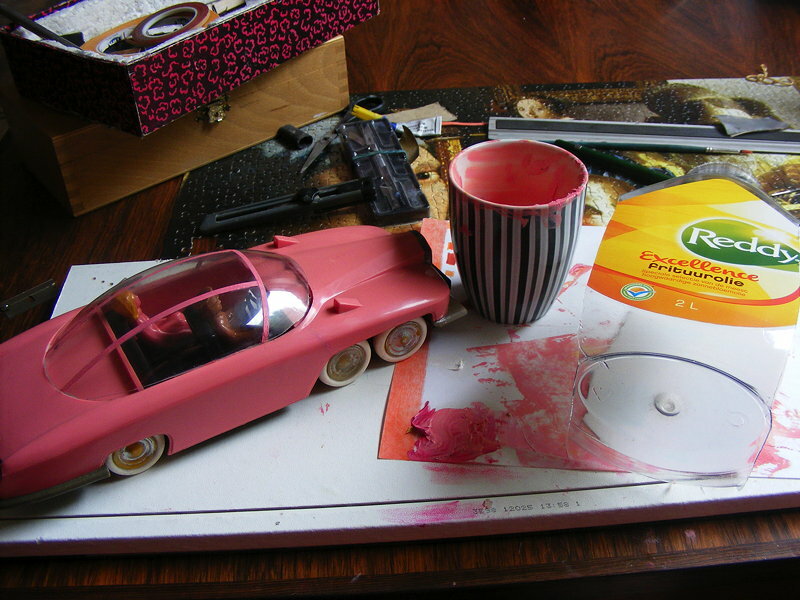 In itself it is a very sturdy metal toy but the paint would be scratched off so those that where really used as toys often ended up in a totally battered state. It is one of the few toys I actually played with as a child myself. In the end I decided to restore it. It has been hand painted and relettered, Even details which where never on the original toy have been added. Have a look at the red exhaust. I actually made those out of feltpen covers. They are very much nearer to the original from the series then the original Dinky items. If one considers that the whole model is only about 125 mm / 5 inches long overall the results are actually rather good, me thinks. This is an example of a running project. Er, it has actually been "running" for years already but sooner or later I'll finish it. In itself it is not an ultra rare model but I could buy this battered one for only a few Eu's. All the glass surfaces are flat, so it will be rather easy to replace those. 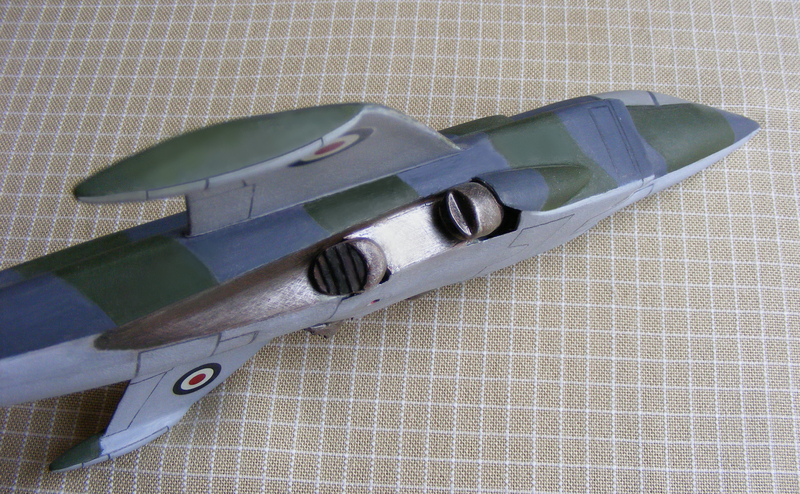 The deck in the back compartment is not original Dinky but should add a bit of detail. Total Dinky originality is not an issue anyhow. No “mint and boxed” forgeries reside in my collection. This one is in itself less unique. Just a Timaya kit with a bit of added detail. I included it here because I am again quite pleased with the results as such. This was also hand painted. No spray painting has been used on any of the models on these pages. I even hand painted a whole motorcycle (see my Petranodon motorcycle). This again is a regular Timaya model kit. When I bought it one complete molding sprue was however missing so I had to scratchbuild a lot of details myself. Nearly all the antenna's and the railings on the top of the docking bay, for instance.